Discussion in 'Skydentify - What is that Thing in the Sky?' started by Mick West, Feb 9, 2019. 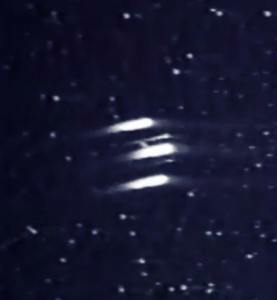 The video shows what looks like three bright streaks and two dim streak move across the sky. At one point there's a flash. Suggestions given are a much of meteorites, or some kind of advanced technology craft, possibly alien. However, I think it might just be the landing lights of a plane, smeared out by the long exposure of the old night camera. 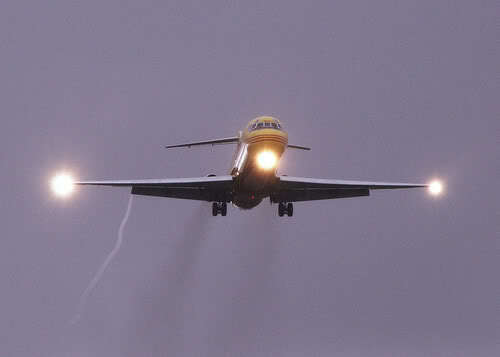 Something like an MD-80 perhaps, with the triangle of big lights, and two smaller lights. I mocked up the scene in Aftereffects, creating a very similar effect with image persistence from frame to frame. Because I had to locate the telescope operators by asking for help from other people, it took well over a month to get the "real data." The crucial information turned out to be far different from what I had been led to believe. I had been told by LaMonica that the angular elevation was low, maybe several degrees ("near the horizon"). However, I learned from the operators that the actual angular elevation was much greater and, in fact, was nearly straight up (85 degrees). I also learned that the telescope was about 10,000 ft above mean sea level (AMSL). This put a whole new light on the matter. It took me all of five minutes (or less) to determine that under this circumstance the lights could be on an aircraft of some nominal wingspan traveling at several hundred mph at a reasonable cruising altitude above the telescope. In fact, any combination of wingspan, W in ft, speed S in ft/sec and height H in ft AMSL which obeys the relations S/(H-10,000) = 0.032 rad/sec and W/[H-10,000] = 0.01 rad would work. (Note: since the telescope is at 10,000 ft AMSL, the assumed H should be no lower than, say, 11,000 ft. Also, the assumed H should be no greater than 45,000 ft which is an upper altitude for typical aircraft). For example, if H = 20,000 ft AMSL the wingspan could be W = 0.01 x (20,000 - 10,000) = 100 ft and the speed could be S = 0.032 (20,000 - 10,000) = 320 ft/sec or 220 mph. Similarly, the video would be consistent with a plane having a wingspan of W = 40 ft and a speed of S = 128 ft/sec = 87 mph providing it were flying only about 4,000 ft above the telescope at H = 14,000 ft AMSL. Naturally there are many (an infinite) number of possible combinations of W, S and H that would satisfy the requirements of the video. The telescope operators told me that, upon seeing the video, they had immediately suspected that it was an airplane, but then they questioned that explanation because they rarely, if ever, see an airplane overflying the telescope installation. One of the men called the FAA to find out if there was any record of an airplane scheduled to fly over Mt. Haleakala at the time of the video. He was told there was no such record (no air route passes over the mountain). 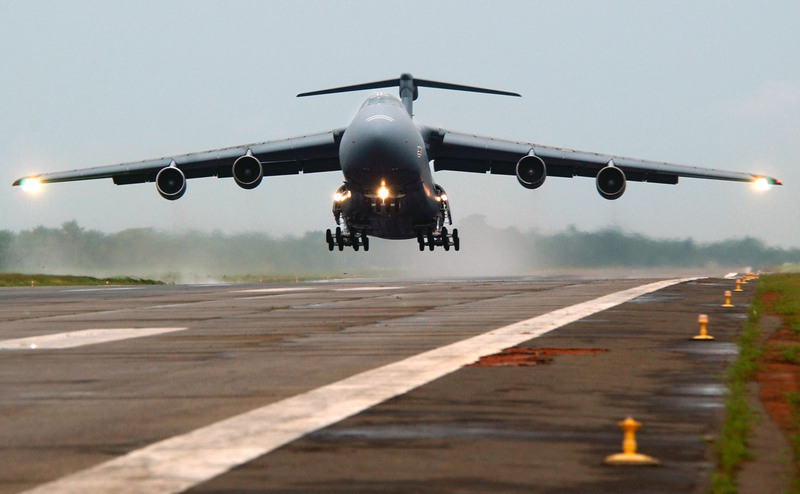 Of course, an aircraft could have flown over the mountain without the FAA having a record of its exact flight path. As soon as the camera crew set up the TV monitor and video machine I began running the video over and over. Text at the beginning of the video stated that it was taken by a GEODS telescope during the year 1993 on day 335 at 032444Z (335th day of the year, December 1, at Greenwich Mean Time of 3:22:24 AM which corresponds to 5:22:24 PM, November 30 in Hawaii). Looks like a fixed wing aircraft with flashing/alternating landing lights to me. Why? The lights do not seem to be alternating. The 2 less bright central lights do seem to alternate. Might help with ID the C5 seems to have 1 central beacon (flashing light), I wish there was some sort of published light pattern DB for aircraft. I wish there was some sort of published light pattern DB for aircraft. Text at the beginning of the video stated that it was taken by a GEODS telescope during the year 1993 on day 335 at 032444Z (335th day of the year, December 1, at Greenwich Mean Time of 3:22:24 AM which corresponds to 5:22:24 PM, November 30 in Hawaii). is this time possible? i'm confused why we are seeing black sky and stars before sunset. this site says sunset was 5:44pm. The two dimmer interior lights look to be alternating to me as @jarlrmai said. The three brightest ones look to be nose and wingtip/fuselage lights. In this case it appears that an airplane would be consistent with the observational evidence. Although I can not prove there was an airplane flying over the telescope, there is no reason to believe that an airplane could not have done so. Since there is no evidence in the video which conclusively contradicts the airplane hypothesis there is no good reason to claim that the lights were something else. Weeks after the show I reported to LaMonica that the lights were probably on an airplane. So far as I know, this information was never conveyed to the audience of Nightline. Maccabee has also commented on the silvarecord article. One thing: why does Maccabee write that 032444 corresponds to 3:22:24am? “These two stars can clearly be seen between the streaks of light… to me this rules out a large structured body. Surely that can just be explained by image persistence, the same effect that blurs out the lights into streaks? 5:22pm is before sunset on that date. Is it meant to be visible-light footage? that's what Mick's OP explanation video shows. The failure of one star image in particular to disappear when it passed between the upper and middle bright lights (where the wing of an aircraft would block the star) was obvious to both of us, as it had been to Jay. This seemed to be strong evidence that the lights were not connected by an opaque body, namely, the wing of an airplane. However, I pointed out that we couldn't be certain because the failure of the star image to dim very briefly might have been some artifact of the camera electronics or the recording mechanism about which we knew next to nothing. As an example of the possible effect of the camera operation on the recording of a star that is momentarily blocked by a wing, imagine a 10 ft wide wing and a wing speed of 300 mph which is 440 ft/sec. The star image could be blocked by the wing for about 10/440 = 0.023 sec. The typical camera frame rate is 0.03 sec per frame. Thus the blockage would occur during one frame time which was too short to be observed under the circumstances - viewing on a (analogue) TV monitor with electronic noise and "twinkling" of the star causing brightness fluctuations at all times. I don't think I would have bothered if I'd seen Macabee's article from the start. I thought this was newly revealed footage at first. Trying to figure out how we see stars if the time was listed as 5:22 PM HST. I would love to have an instrument that can see stars during the daytime. I wonder what filter they were using (I am just joking here)? This indicates the time Macabee listed is probably not correct or misinterpreted. It could have been 3:22 AM HST and not 3:22 AM UTC. One would think that the telescope would have the location in the sky they were looking (RA/DEC or AZ/ALT). I tried to figure out the star patterns and I could not. I did not try too hard but I am guessing that this is in the milky way region based on the statement the scope was nearly overhead and the number of stars visible (assuming 3:22 UTC). Lots of missing data from this.